Below are common attributes associated to Blue Star Creeper. Become a care taker for Blue Star Creeper! Below are member comments regarding how to plant Blue Star Creeper. No comments have been posted regarding how to plant Blue Star Creeper. Be the first! Do you know how to plant Blue Star Creeper? Below are member comments regarding how to prune Blue Star Creeper. No comments have been posted regarding how to prune Blue Star Creeper. Be the first! Do you know how to prune Blue Star Creeper? Below are member comments regarding how to fertilize Blue Star Creeper. 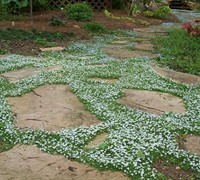 No comments have been posted regarding how to fertilize Blue Star Creeper. Be the first! Do you know how to fertlize and water Blue Star Creeper? Below are member comments regarding how to deal with Blue Star Creeper's pests and problems. No comments have been posted regarding how to deal with Blue Star Creeper's pests and problems. Be the first! Do you know how to deal with pests and problems with Blue Star Creeper? Looking for Blue Star Creeper? Get Blue Star Creeper fresh and large directly from the grower to your garden! Buy Blue Star Creeper online from the nursery wholesalers and save BIG! Blue Star Creeper is a mat-forming perennial groundcover perfect for planting between stepping stones, as a groundcover in landscape and garden beds, under roses and Japanese maples, or in pots. It does best in well-drained but somewhat moist soils. You might need to provide some supplemental water during a drought. Grows well in full sun or part shade. Afternoon shade is appreciated. Blue Star Creeper does not require pruning. I feed my Blue Star Creeper one time a year in spring with a mild organic flower food. I've seen no insect, pest or disease problems with Blue Star Creeper. In the absence of average rainfall, during prolonged periods of hot, dry summer weather it may be necessary to provide supplemental water. Before planting Blue Star Creeper in mass as a groundcover, it might be necessary to do some site preparation. First, you'll need to eliminate any weeds or grasses that are growing in the planting area. There are many ways to do this however spraying with a weed killer is easiest and most efficient. If you are planting groundcover plants under a tree, and intend to till the soil before planting, be careful not to till to deep and damage tree roots.